Hattiesburg, Miss. - A 13-5 run midway through the second half helped open up what had been a tightly contested game between the #1 LSUA men's basketball team and William Carey as the Generals pulled away late to finish the season sweep of the Crusaders 90-76 Saturday afternoon at Steve Knight Court at Clinton Gymnasium. The first half was mostly a back-and-forth affair until the Crusaders used a 10-0 run to turn a 19-17 LSUA lead into a 27-19 Crusaders advantage as Brandon Cranford sank a three-pointer with 9:04 left. But the Generals had an immediate response, scoring 11 of the game's next 15 points to get the lead right back as Devin Jackson sank a three-pointer to put LSUA up 30-29 with just more than 6:30 left before halftime. Over the final six minutes, neither team would gain a lead larger than one possession, and when Mikkel Norment sank a pair of free throws with just seconds left before the break, the two teams would retreat to the halftime locker room with the score all even at 41-41. Out of the break, the trend of no lead greater than one possession continued for the first five and a half minutes of the second half. Finally, the Generals broke the trend as Mikkel Normant made a strong drive to the rim and scored while being fouled with just less than 14:30 remaining to give the Generals the lead for good at 51-50. After a defensive stop, Normant did it again as he attacked the rim and scored while getting hammered. This time, he converted the three-point play and LSUA's lead was at 54-50 with 14 minutes left in the game. A shot by Brandon Cranford cut the lead back down to two on William Carey's ensuing possession, but Brandon Ellis's three-pointer the next time LSUA touched the ball started the run that gave the Generals the breathing room needed to close out the game. LSUA's lead finally hit double digits for the first time as Normant again beat the defense and got to the rim for a lay-up and a 67-57 Generals lead with eight minutes remaining. LSUA maintained that lead for the remainder of the contest, getting it up to a game-high 14 points with just less than 1:30 left as JaMichael Brown beat the defense down the floor and got a lay-up for an 88-74 Generals lead to close out the win. "This is another nice road win for the Generals heading into Christmas break," said LSUA head coach Larry Cordaro. "William Carey is a really good opponent and we had to battle our butts off to get out of here with a good win. We've really focused lately on defense, so I'm proud with the improvement I'm seeing on the that side of the ball, holding them to just 43.5%. We're still turning the ball over a little more than I'd like, but we continue to work and get better every day. I was very happy to see a lot of LSUA fans travel today, it meant a lot to see our supporters there, especially some of the players' family members. We learned a lot from the 2018 portion of our schedule and I feel we have a lot of good things coming for the Generals in 2019." William Claiborne led the Generals in scoring with 18 points in the win, scoring on eight of the 13 shots he took in the contest. He also grabbed nine rebounds, tallied an assist, and had two steals in the win. Devin Jackson and JaMichael Brown each had 16 points with Jackson hitting four three-pointers and grabbed six rebounds, while Brown was four of four at the free throw line and had five assists and four rebounds. Mikkel Norment ended the game of 15 points, including a couple of key buckets during the main run in the second half. Phillip Rankin, Jr. closed out the leading scorers for LSUA with 12 points to go along with five rebounds, two assists, and a blocked shot. The Generals hit above 50% in both halves, finishing the contest at 52.3% from the field, including eight shots made from long distance for 42.1% from above the arc. Defensively, the Crusaders (7-4) were held to 43.5% overall and just 24.0% from above the arc, making six of 25 attempts from distance. Where LSUA made 14 of their 18 attempts at the free throw line, Carey was just ten of 17 at the stripe. LSUA also out-rebounded the Crusaders 43-31, but turnovers helped William Carey keep it close as LSUA gave it up 19 times while the Crusaders only coughed it up 11 times. The win gave the Generals the season sweep over the Crusaders after LSUA was a 91-72 victor over William Carey in The Fort back on November 7th. #1 LSUA (13-2, 3-1 RRAC) now heads into the holiday break on a five-game win streak, preparing for the resumption of RRAC play after the calendar flips to 2019. The Generals' first game following the break will be in San Antonio on January 3rd against Our Lady of the Lake. Tip-off against the Saints (4-8, 2-2 RRAC) is set for 7:30 P.M. at Mabee Gymnasium. 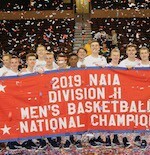 The Benedictine University men's basketball team will hold their annual summer basketball camp in the Rice Center from June 11-14 with the goal of creating an entertaining environment for learning the game of basketball. The camp focuses on excellent instruction in the fundamentals of offensive and defensive basketball and is run by head coach Keith Bunkenburg, the winningest coach in program history and the 2015-16 NCAA Division III Coach of the Year. The camp will run daily from 9:00 a.m.-3:00 p.m. and is for boys in grades 3-8. The cost is $238 for the week and includes lunch, a camp t-shirt and a camp basketball. 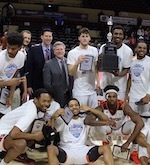 F: Lyle Hexom (6'8''-F) of Peru St.
Elijah Staley (6'6''-G-96) of Dalton St.
Deandre Clark (6'3''-G) of Harris-Stowe St.
Damek Mitchell (5'9''-PG-98) of Lewis-Clark St.
Brandon Jones (6'6''-G/F) of Peru St.
Derek Novsek (6'3''-G/F) of San Diego Chr.